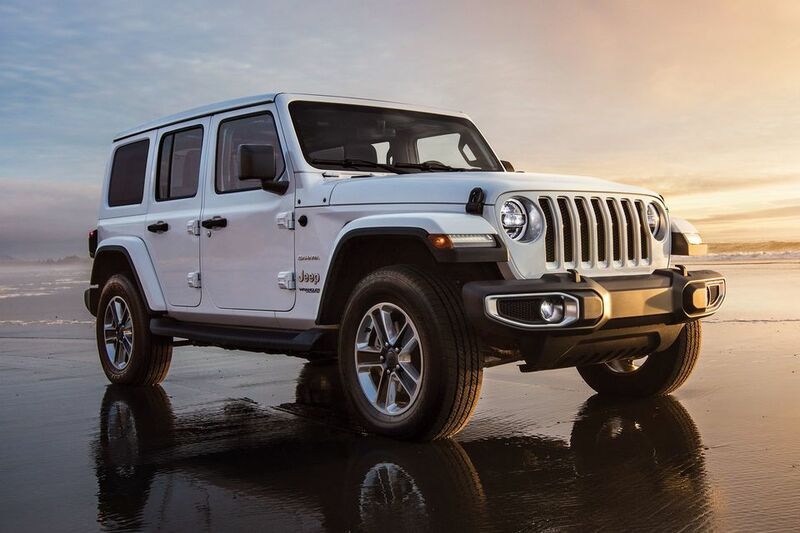 Introducing the All New 2018 Jeep Wrangler JL. Authentic styling, versatility, comfort and technology. 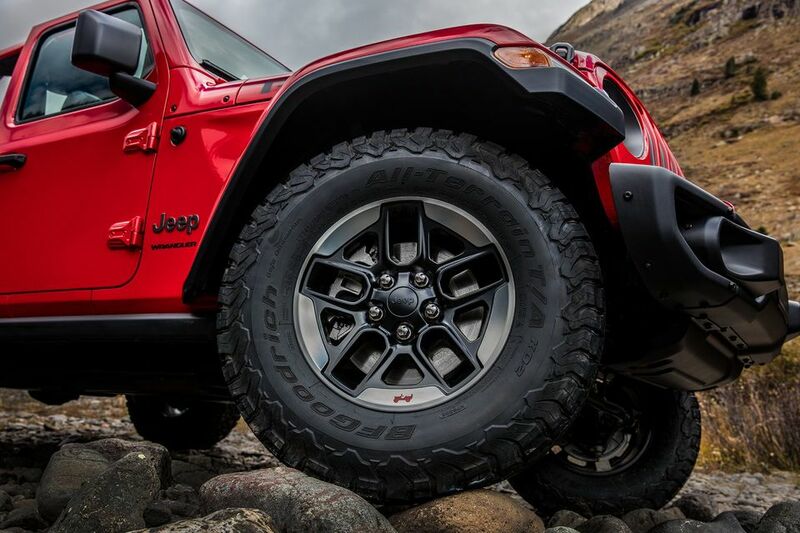 The most capable Wrangler Ever! 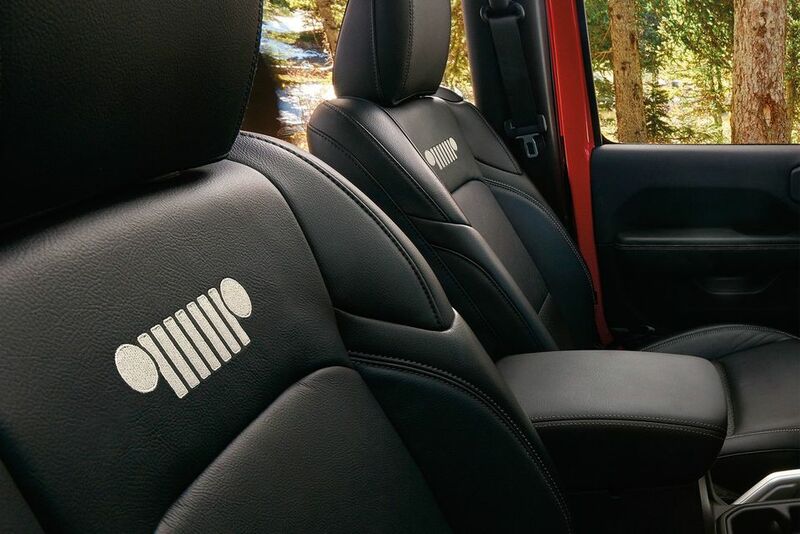 Precision craftsmanship and high-quality materials are found throughout the all-new Wrangler cabin. The heritage-inspired centre stack features a clean, sculpted form that complements the dashboard design and sports a finish dictated by model choice. 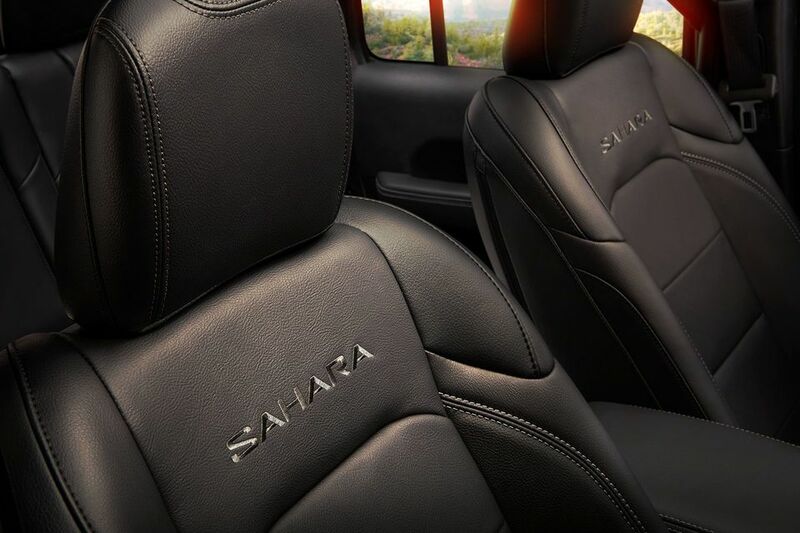 The instrument panel features a soft-touch surface with accent stitching on Sahara® models. 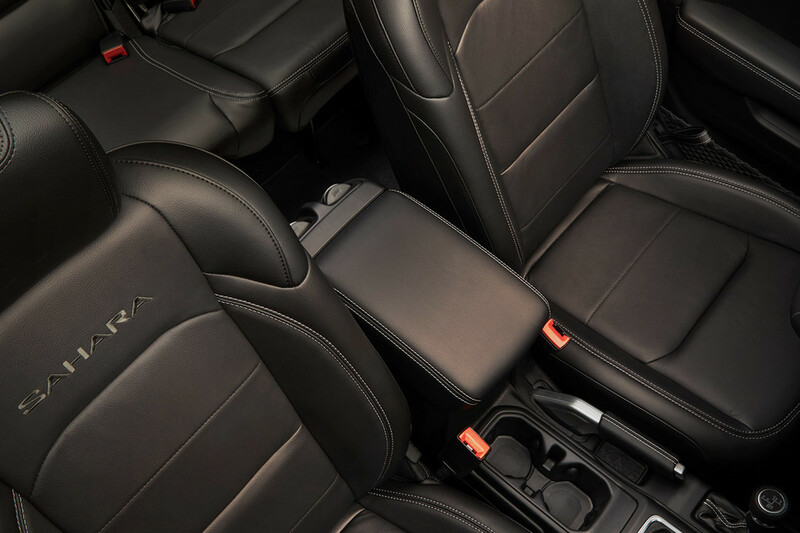 Standard cloth or available leather-contoured seats feature accent stitching and includes adjustable lumbar support. Heated front seats and steering wheel are also available. The iconic folding windshield1 has been redesigned for easier use and improved aerodynamics. 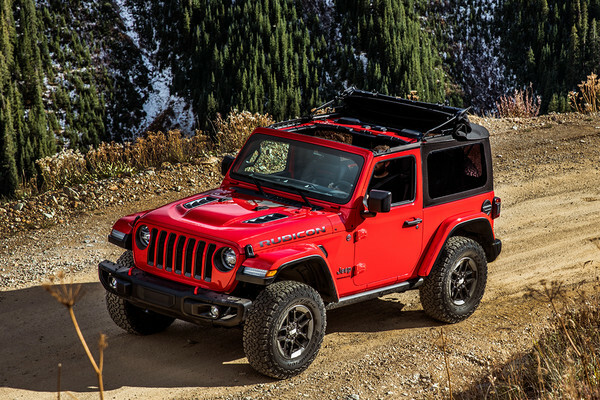 The windshield’s rake has been optimized for improved aerodynamics and features a new 4-bolt design at the top of the frame to allow the windshield to fold down quickly and easily. 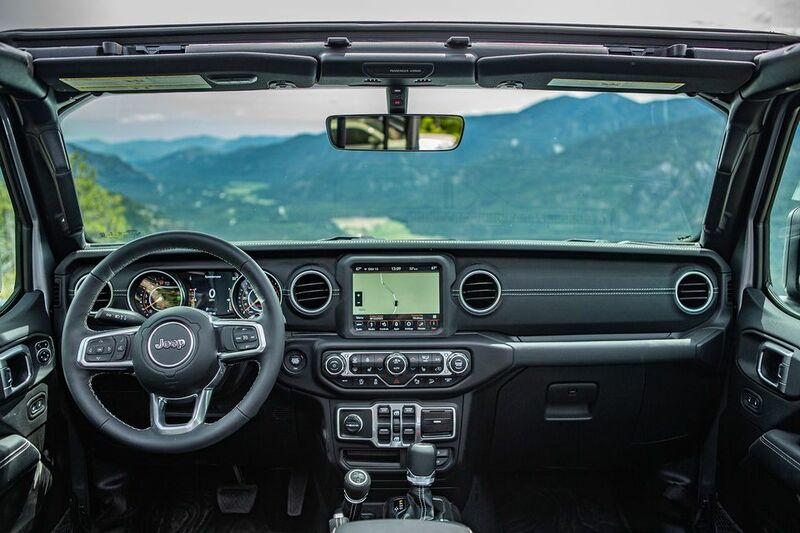 A new header bar now connects the A-pillars and stays in place even when the windshield is folded down. This allows the rearview mirror to remain in place even with the windshield folded. 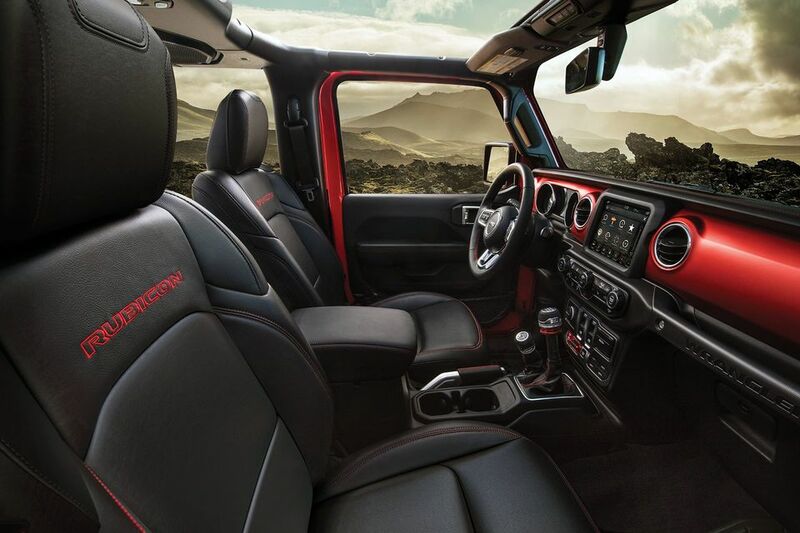 The purpose-built design of the Wrangler interior features new and upgraded conveniences. Functional features like climate and volume control knobs, and charging and connectivity are all sculpted for quick recognition and are within easy reach of the driver. 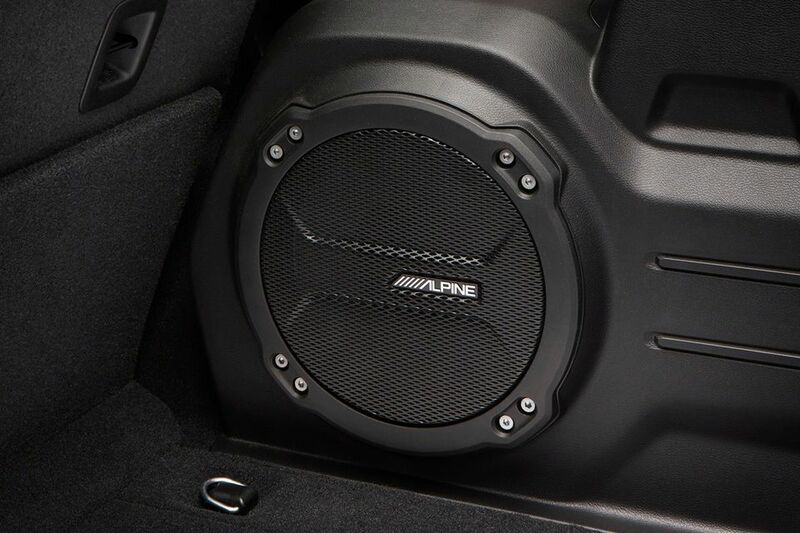 So too, is the new push-button starter, featuring a weather-proof surround. 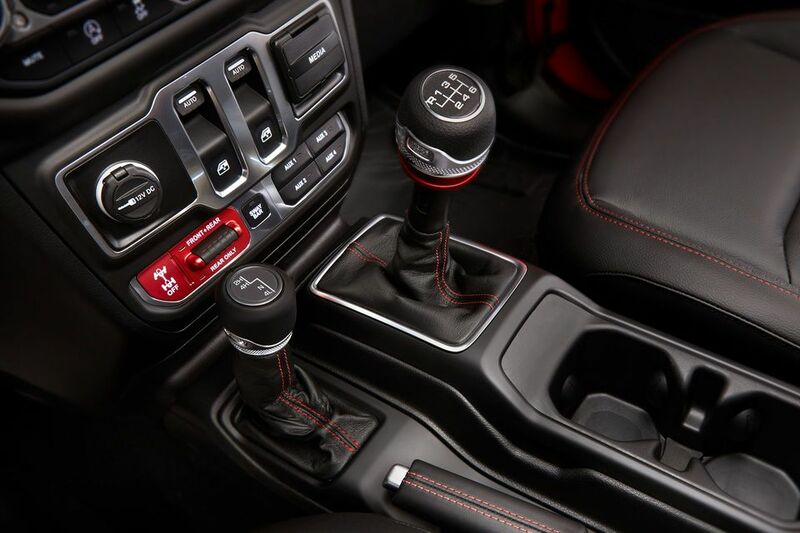 The redesigned centre console houses the gear shifter, transfer case and parking brake. And yes, the carpets are removable and there are still drain plugs in the floor. 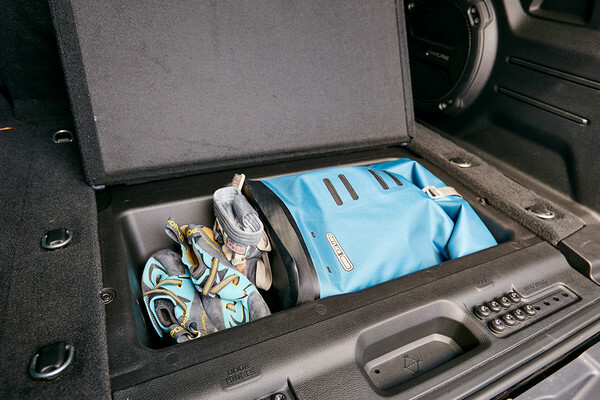 Clever and secure storage spaces let you bring more for all your adventures. Durable mesh pockets that run the length of the doors provide a handy place to keep small items. The glove box is now damped and like the redesigned centre console, can be locked to secure valuable when the top is down. 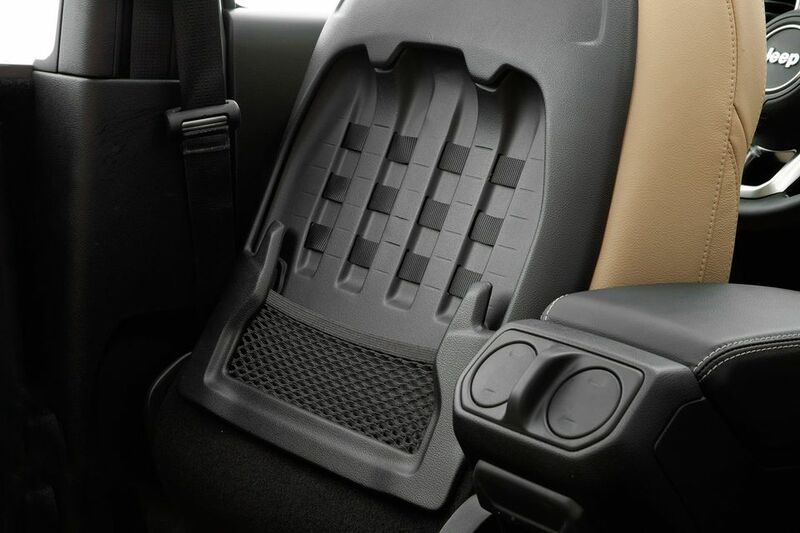 An under-floor storage tray is the rear cargo area also keeps small items out of sight. New for 2018, the available Trail Rail™ Cargo Management System provides additional storage options and allows easy access to your stuff in the cargo area. 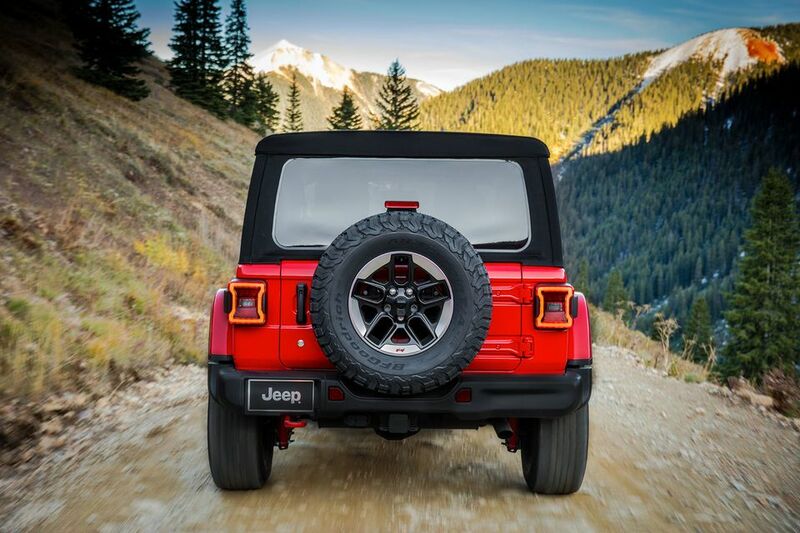 The All-New 2018 Wrangler exterior features evolutionary updates to iconic Jeep® design cues. 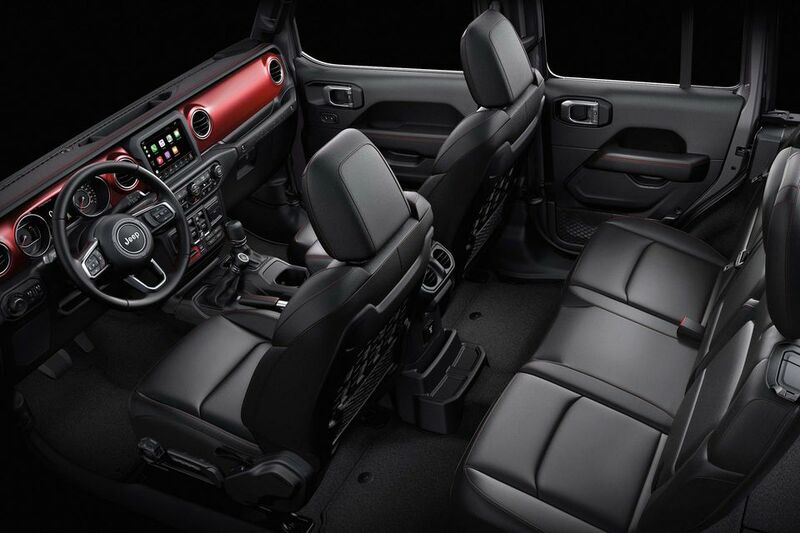 The new look is bold and rugged with a wide stance, lowered beltline and larger windows. 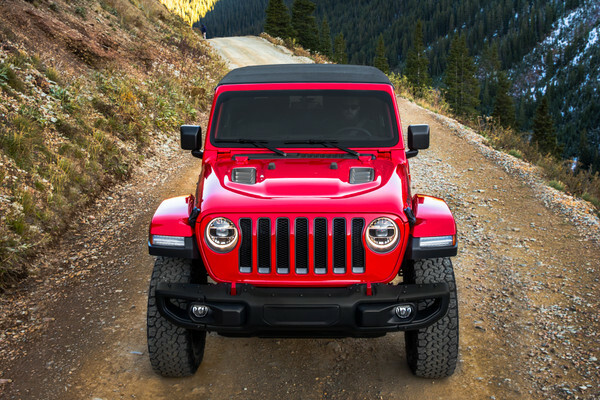 The redesigned 7-slot grille and sculpted hood pa homage to the legendary Jeep CJ. And the top of the grille has ben subtly swept back for aerodynamics. 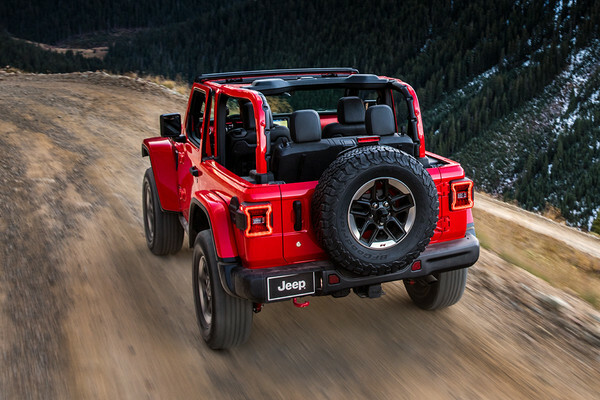 The front turn signals are now in the front fender flares, and all models feature exposed bod-coloured sport bars, which are wilded to the body and include integrated grab handles. 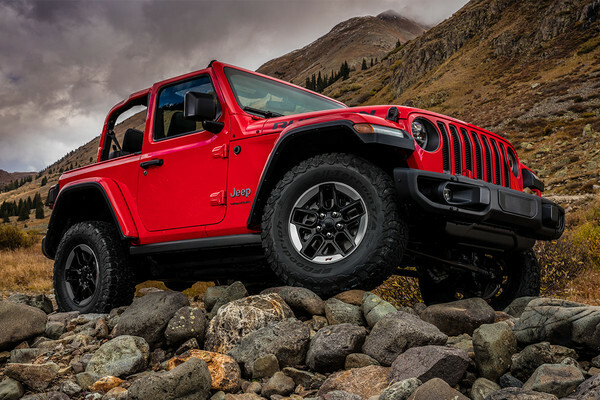 The all-new Wrangler offers a range of new top options for 2018. 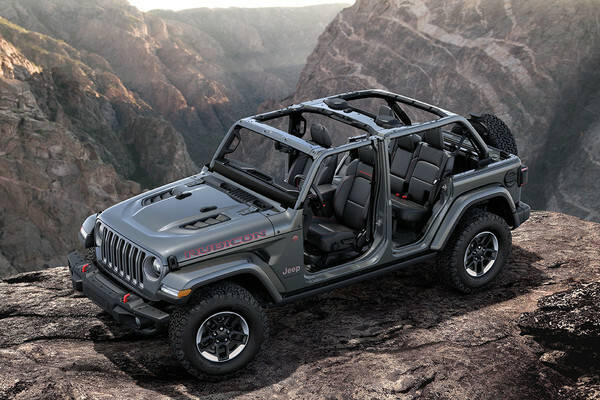 The new Sky One-Touch™ Power Top (late availability), is the first-ever available power convertible top on a Wrangler, and opens the full-length canvas roof with the push of a button. 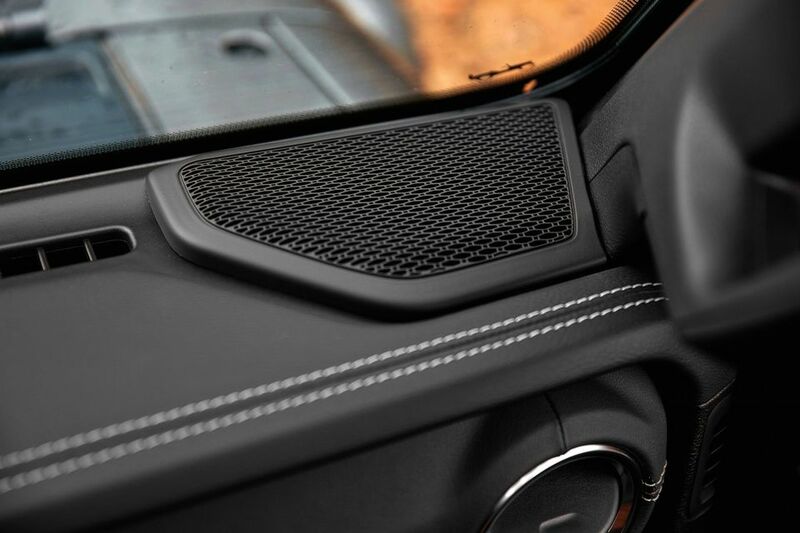 The premium Sunrider® Soft Top now features retainers that slide into a track for easier rear passenger window removal. Further upgrades provide easier access to partial and full opens positions. 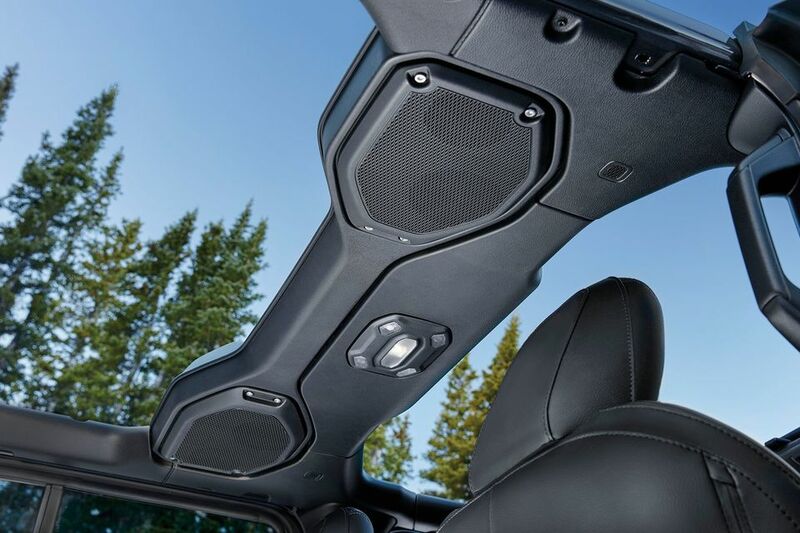 The available 3-piece Freedom Top® hardtop has been made lighter, making it easier to use and enjoy more open air. Smart use of lightweight aluminum helps improve efficiency and makes it easier to handle removable features. The hood, fenders, magnesium sing gate, doors and hinges are all made of lightweight aluminum, helping to reduce wight and boost fuel economy. 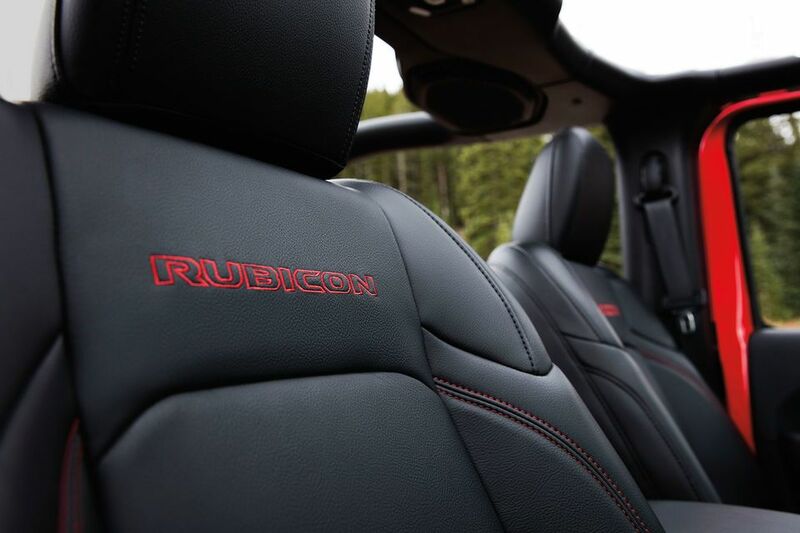 It also makes it easier to remove, and easier to enjoy open-air driving. 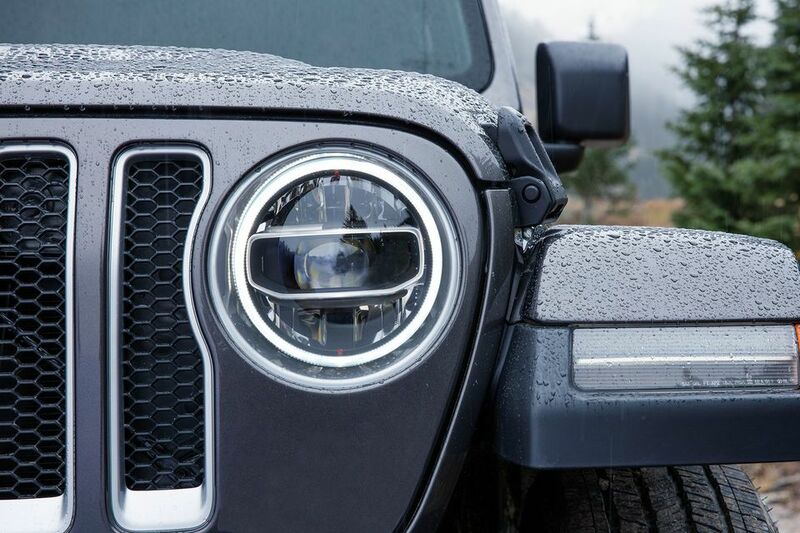 New available LED headlamps are available on Sahara® and Rubicon® for a truly distinctive look. With the LED package, the forward turn signals on both models are LED and are now positioned on the front of the trapezoid wheel flares. 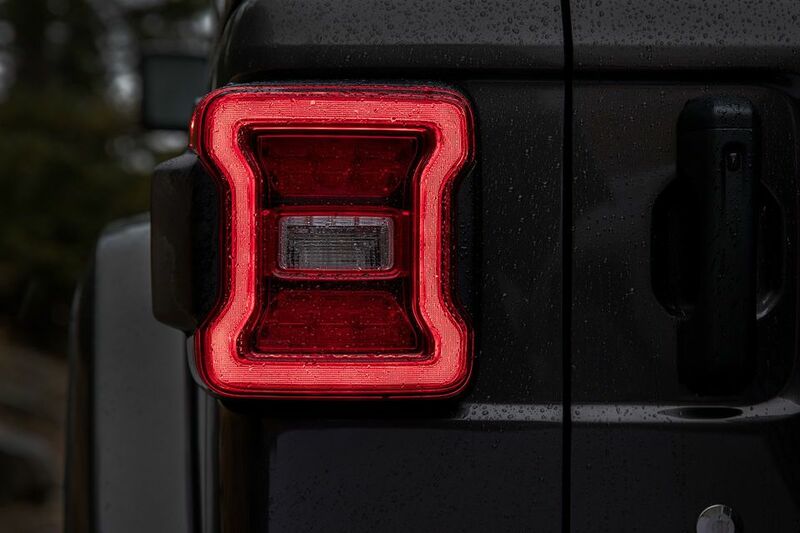 Included with the LED lighting option are premium LED taillamps. 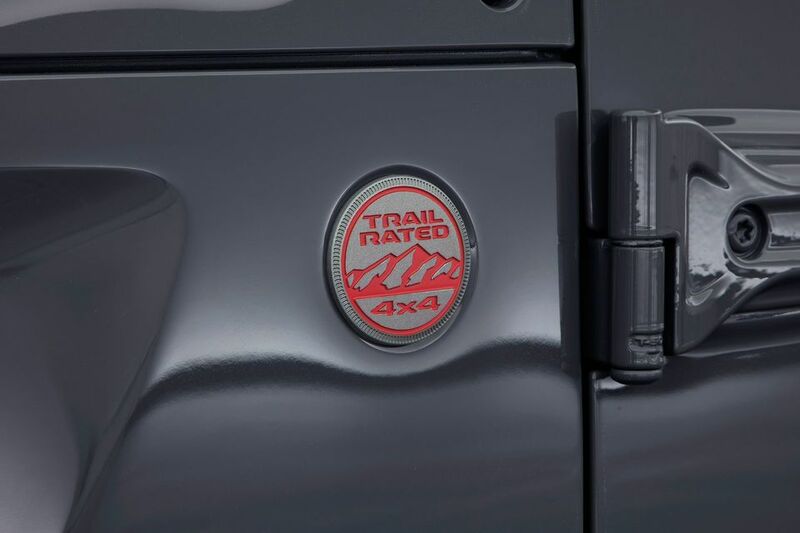 The lights deliver bright modern performance but still feature a rugged Jeep® brand look. Keep tabs on your drive while keeping your eyes on the road and hands on the wheel. 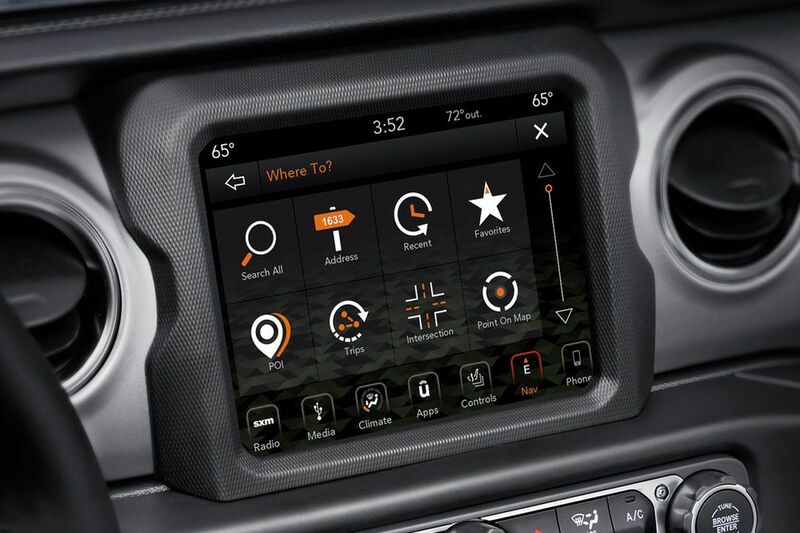 The new 7-inch reconfigurable driver information display, standard on the Rubicon® and Sahara®, lets you choose the real-time driving data you want to see. Easily check out speed, tire pressure, fuel economy and other key information. A scroll button on the steering wheel lets you call up more data while keeping your hands on the wheel. 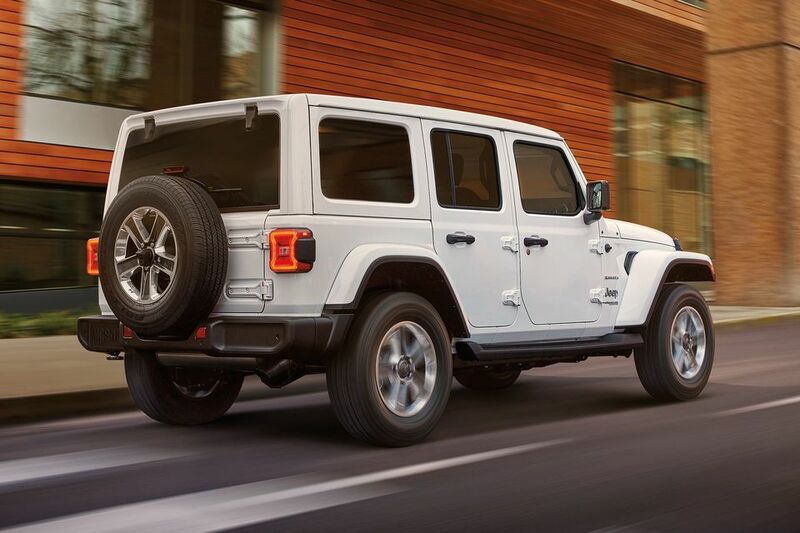 The all-new Wrangler is the most technologically advanced Wrangler ever2. The 4th-generation Uconnect® multimedia centres include full-colour displays with pinch-in-zoom capability and are available with a 5-. 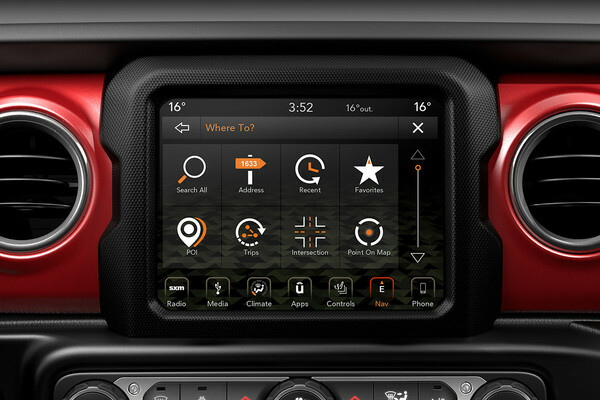 7- or 8.4-inch touch screen, the largest ever offered on a Wrangler. This system support Apple CarPlay3, the smarter, safer way to use you iPhone in the car. Listen to Apple Music, get directions with Apple Maps, and make calls and send messages with your voice with Siri. Available Android Auto™ provides hands-free access to content on your personal device3. 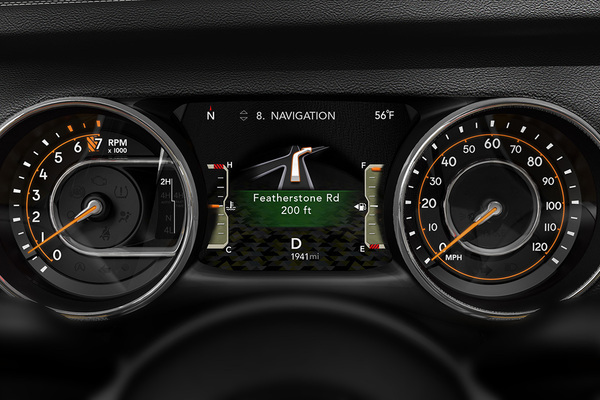 Premium navigation with turn-by-turn directions is also available4. 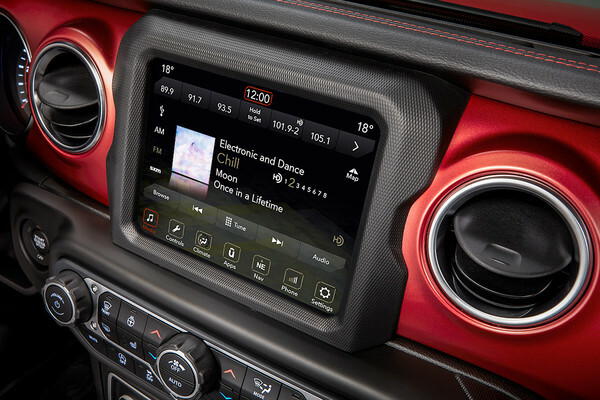 Get the latest SiriusXM services with the available Uconnect® 8.4 NAV multimedia centre. 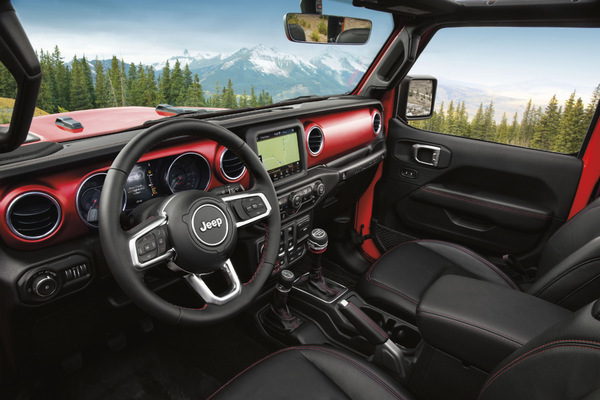 Each is accessed through the 8.4-inch touchscreen, the largest ever offered on a Wrangler. SiriusXM Travel Link:5 Provides weather reports, fuel prices, movie times, and sports scores. SiriusXM Traffic:5 Helps you avoid traffic tie-ups by alerting you to major collisions, construction and road closings. Thanks to Keyless Enter ‘n Go™, you can drop the classic Dig and Search move for your keys. This standard feature allows you to simply grab a door handle to either lock or unlock your doors. This also works for opening the rear swing gate. 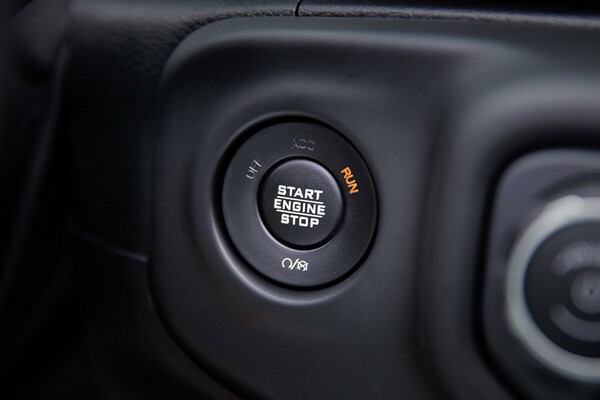 With the Smart Remote Start System – standard on models with the 8-speed automatic transmission – you can start the engine with a fob from as far away as 90 metres. 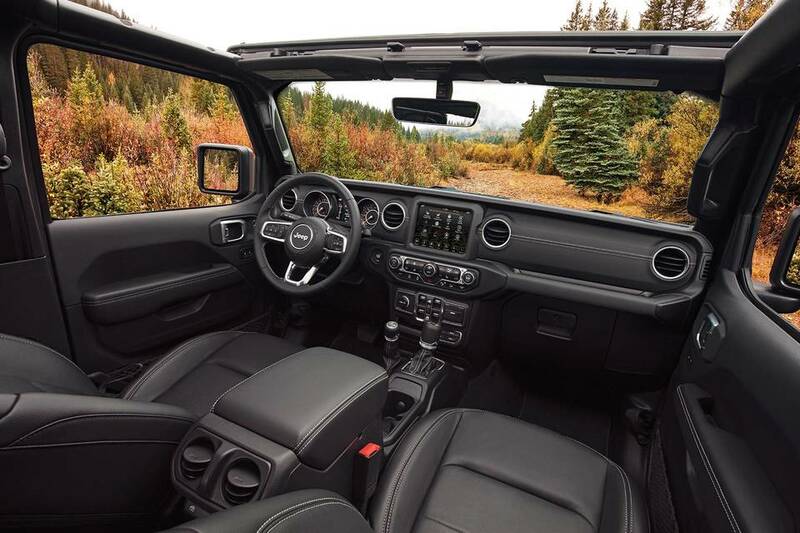 You can also activate the climate control system and turn on available heated front seats and steering wheel. 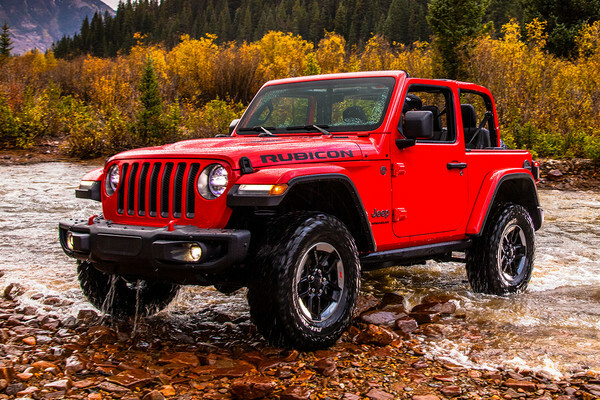 The All-New 2018 Wrangler offers adventurers 2 excellent powertrain options. The standard 3.6L Pentastar™ V6 delivers Best-In-Class 285 hp,8 260 lb-ft of torque and now includes Engine Stop/Start (ESS) technology. 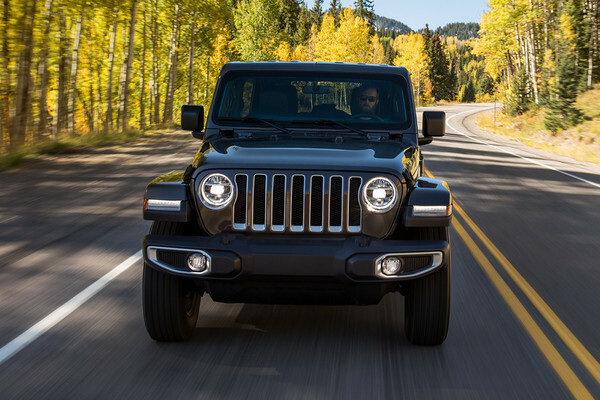 The available all-new 2.0L 4-cylinder turbocharged engine with eTorque technology outputs 270 hp and 295 lb-ft or torque, and is paired with a new 8-speed automatic transmission. 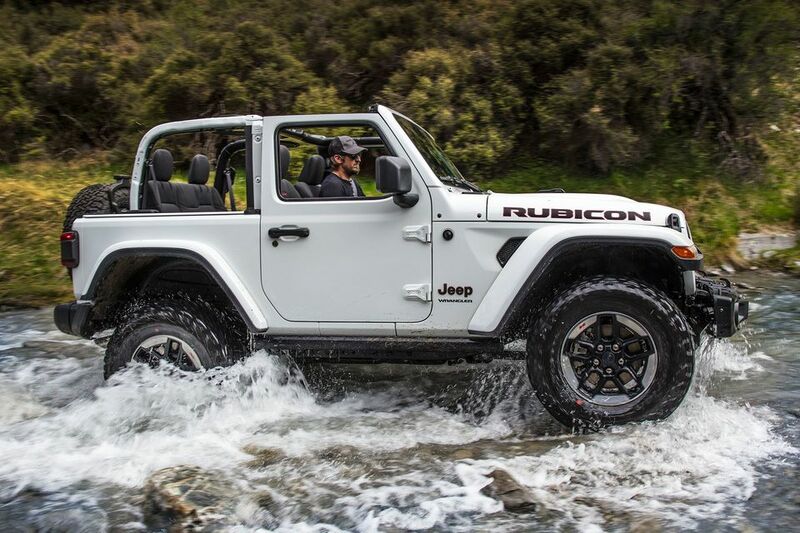 The all-new Wrangler Rubicon® delivers superior off-road performance for all your driving fun. 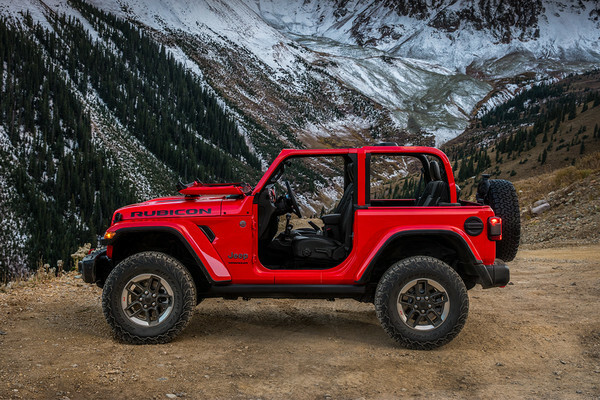 The Rubicon’s standard Rock-Trac® 4×4 system features heavy-duty next-generation Dana® 44 front and rear axles and delivers extreme rock-crawling ability with 4:1 low gear ratio. 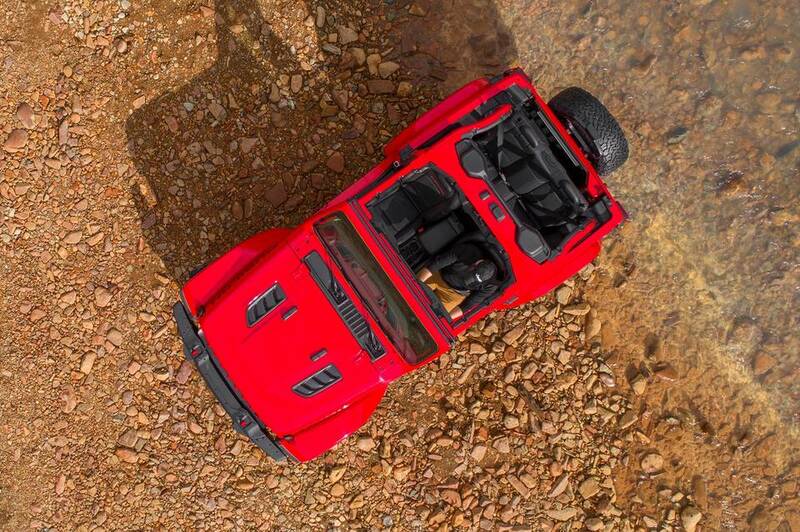 And improved crawl ratio numbers of 84.2:1 with the 6-speed manual makes challenging off-roading easier. The new Selec-Trac® 4×4 System delivers greater flexibility and efficiency on every drive. 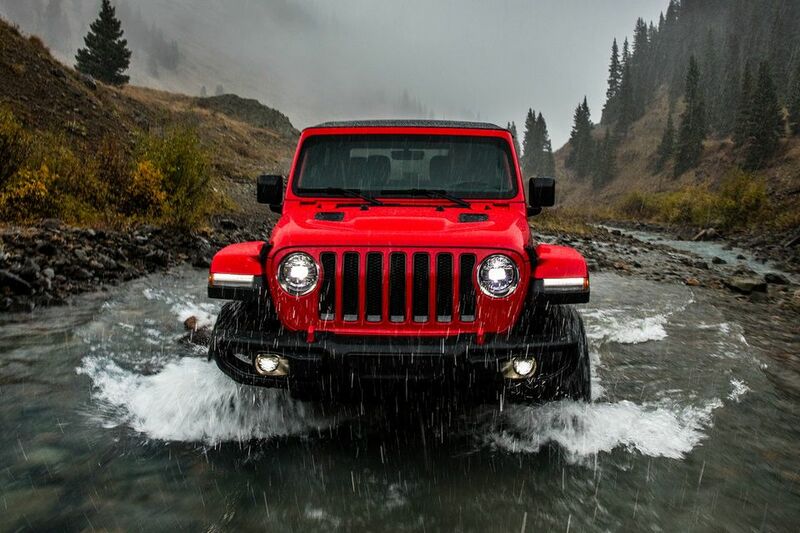 Available for the first time ever on Wrangler, this 2-speed transfer case features a full-time mode that will automatically switch from 4×2 t 4×4 when conditions dictate. Relying on wheel spin and traction control sensors, Selec-Trac helps make driving in uneven terrain and nasty weather safer and smoother while delivering superior fuel efficiency when 4-wheel drive ins’t needed. 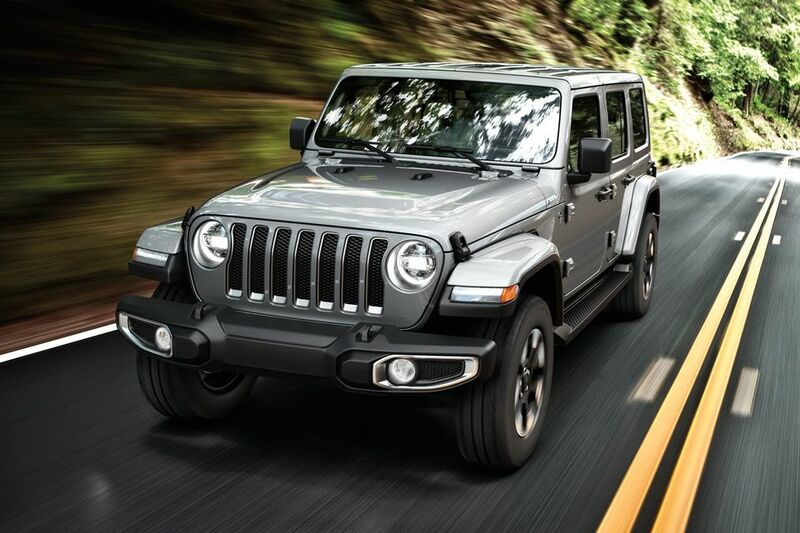 The new TorqueFlite™ 8-speed automatic transmission is available on all Wrangler models. 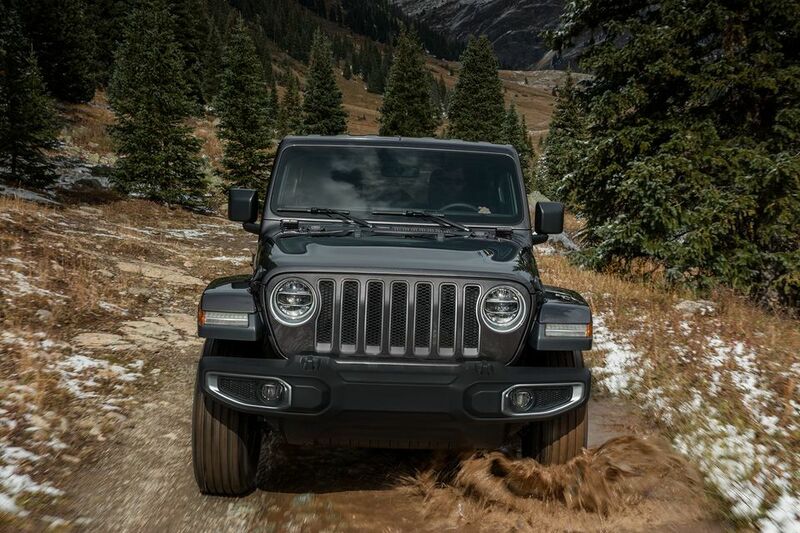 It’s designed to optimize engine output while on the trails and support smooth, efficient power delivery on the highway. The TorqueFlite allows it to adjust shift patterns in response to driving conditions, helping deliver the best possible fuel economy and drivability balance. 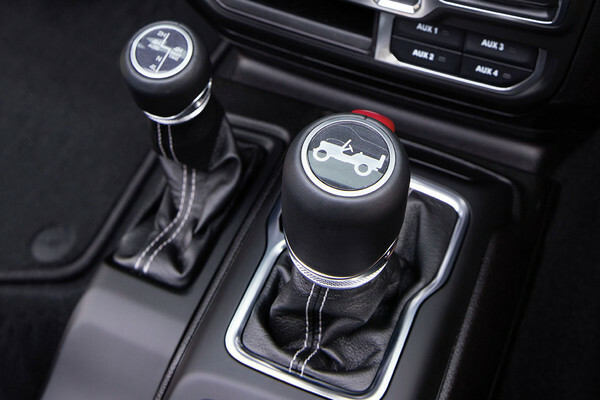 The result is automatic shifting ideally attuned to the performance requirements of almost any driving demand. 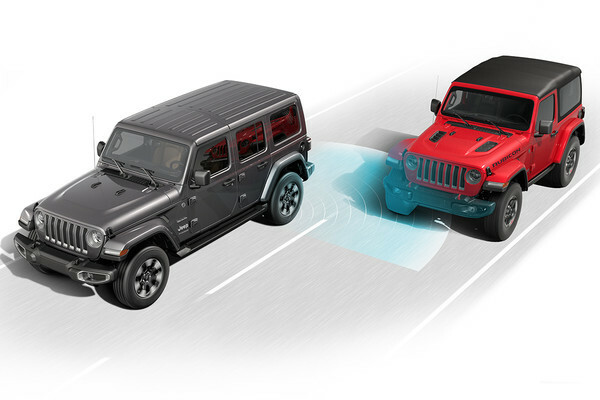 The All-New 2018 Wrangler uses available safety technology for safer driving and parking. Both Blind-Spot Monitoring9 (BSM) and Rear Cross-Path Detection9 uses sensors to detect other vehicles driving close to you. BSM can alert you with an audible tone and warning light on the sideview mirror if there’s a vehicle in your blind-spot area. When you’re backing out of a parking sport, Rear Cross-Path Detection9 can warn you of vehicles or pedestrians approaching from either side. 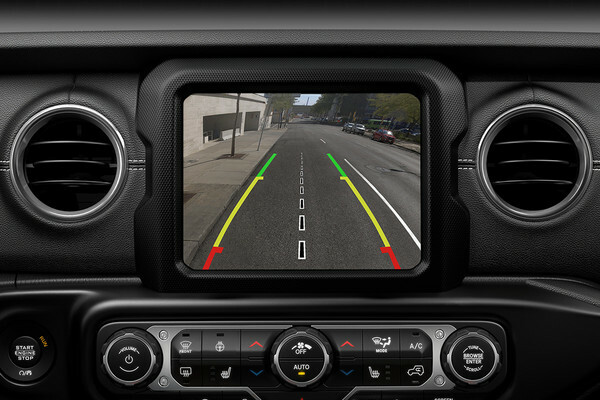 Keep a close eye on the area behind your Wrangler with the ParkView® Rear Back-Up Camera.9 When reversing, a wide-angle image and dynamic gridlines in the Uconnect® touchscreen, helping you safely back up to a parking spot, trailer hitch or boat launch. 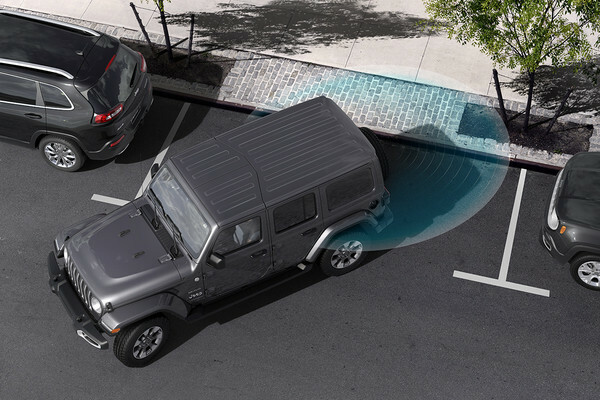 The available Park Sense® Rear Park Assist System9 uses ultrasonic sensors to detect obstacles behind you. It can sound an alert when you get close to a potential hazard while parallel parking or backing into a parking spot. 1 Be sure to follow all instructions in the Owner’s Manual for removal of top, doors, and lowering of windshield. 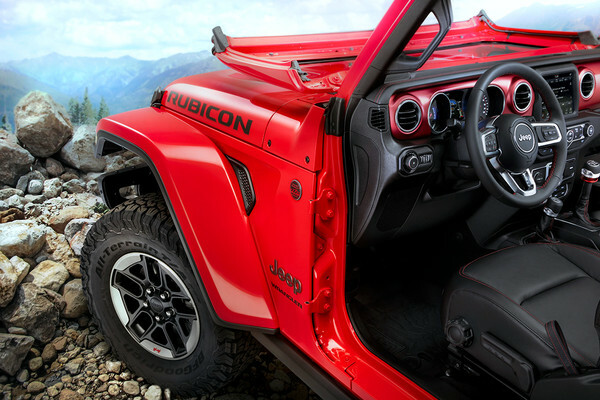 Driving with the doors off and windshield down is for off-road use only. 2 Based on WardsAuto Small Sport/Utility segmentation and Small Cross/Utility segmentation. 3 Driving while distracted can result in loss of vehicle control. Only use mobile phones and other devices, even with voice controls, when it is safe to do so. Apple CarPlay requires a compatible iPhone connected via USB cable to the Uconnect® system. Apple CarPlay is a trademark of Apple Inc. Data plan rates may apply. Android Auto requires the Android Auto app on Google Play and AndroidTM compatible smartphone running Android 5.0 Lollipop or higher. Android Auto is a trademark of Google LLC. 4 Never program while driving. GPS mapping and available 3D navigation may not be detailed or available in all areas or reflect current road regulations. 5 Requires SiriusXM Radio subscriptions governed by SIRIUS terms and conditions available at siriusxm.ca. 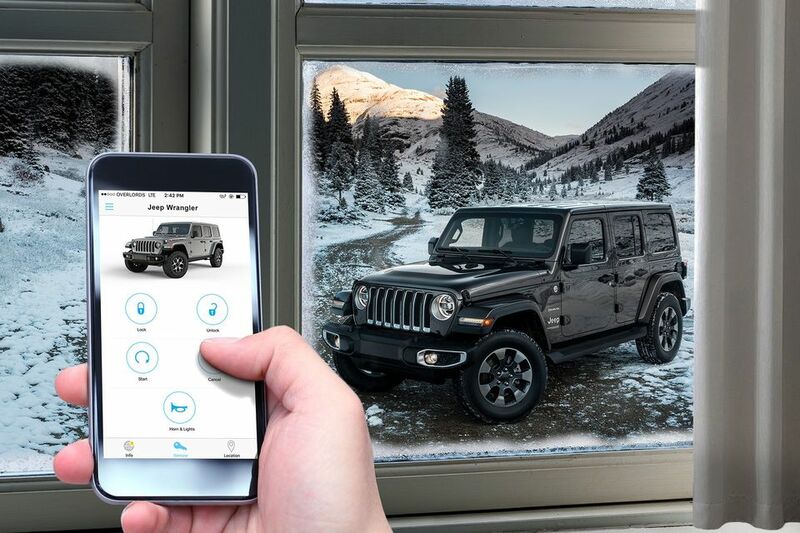 6 All SiriusXM Guardian-equipped vehicles come with a 12-month trial effective on the date of purchase or lease of a new vehicle. Enrollment in the trial is required to receive service. Upon expiration of the trial period, purchase of a subscription is required to continue SiriusXM Guardian. Services can only be used where cellular coverage is available. See Uconnect® and SiriusXM Guardian Terms of Service for complete service limitations. 7 Only available with automatic transmissions. 8 Based on WardsAuto Small Sport/Utility segmentation and Small Cross/Utility segmentation. 9 This is a driver convenience system, not a substitute for active driver involvement. The driver must remain aware of their surroundings and be prepared to take corrective action to avoid collisions.